When the spring peas make an appearance, my go to dish to make is this soup. Really, there is no soup easier, more beautiful and more delicious. The strawberry garnish is everything! In a large saucepan over medium-low heat, add butter, leeks and onion. Cook, stirring, until onions are translucent and leeks are tender (about 5-10 minutes). Add the chicken stock, increase the heat to high and bring to a boil. Add the peas and honey, then cook for 3 minutes, until the peas are tender. Remove from heat and add the mint. Salt and pepper to taste. Working in batches, place 1 cup of the soup in a blender, place the lid on top and puree on low speed. With the blender still running, open the vent hole in the lid and slowly add more soup until the blender is three-quarters full. Pour the soup into a large bowl and repeat until all the soup is pureed. Just before serving, warm soup over low heat and stir in yogurt. 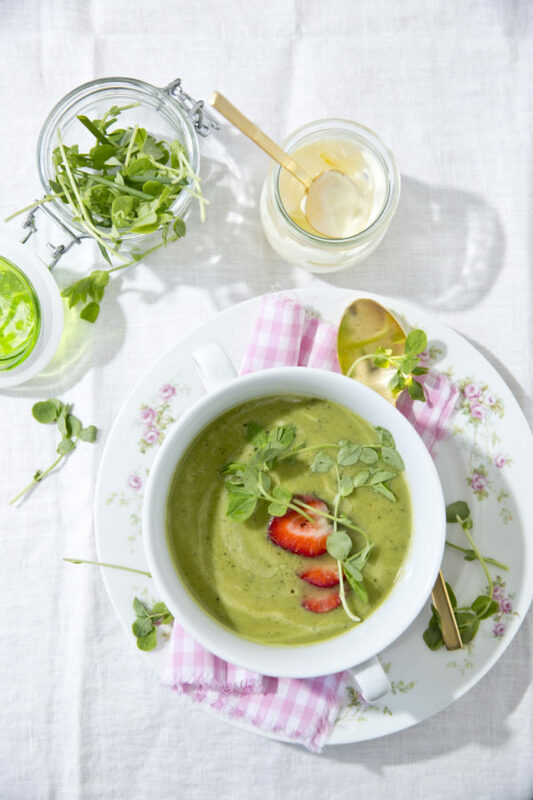 Spoon the soup into bowls and garnish with pea shoots, sliced strawberries and chopped chives.